n.pl chemical substances that sensitize the skin to the effects of the sun, thus leading to irregular pigmen-tation and increasing the risk of sunburn and phototoxicity. Evaluation of flavonoids and furocoumarins in bergamot derivatives by HPLC-DAD. 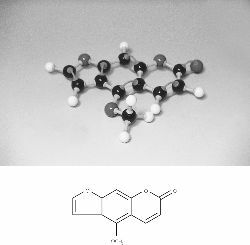 Vilegas JH, Lancas FM, Vilegas W, Pozetti G (1997) Further triterpenes, steroids and furocoumarins from Brazilian medicinal plants of Dorstenia genus (Moraceae). 1,2) It is a nonimmune reaction caused by exposure to chemicals called furocoumarins and psoralens, found in a variety of plants and fruits such as lemons, limes, celery, parsnips, figs, carrots, dill, mustard, and rindweed. Phytoalexins that are induced in response to fungal infection include isoflavonoids, pterocarpans, furocoumarins, flavans, stilbenes, phenanthrenes (Cherif et al. Zottola, "Isolation and identification of antimicrobial furocoumarins from parsley," Journal of Food Protection, vol. Isolation and identification of furocoumarins from the seeds of Psoralea corylifolia L.
Fresh grapefruit showed the most apparent association with melanoma among individual citrus products, which may be explained by its higher levels of psoralens and furocoumarins when compared with oranges," the researchers noted. Exposing skin to furocoumarins along with a dose of sunshine can result in painful sores and blisters. Variation of bioactive furocoumarins and Xavonoids in different varieties of grapefruits and pummelo. The biological and pharmacological interest of marmesin, as well as that of many other furocoumarins is well illustrated in the literature [18, 34-38]. Antihyperlipidaemic and antihypercholesterolaemic effects of Anethum graveolens leaves after theremoval of furocoumarins.